Dear visitors! In this post you're not getting any tips! Today I would like to tell you the little story behind the establishment of Marks PC Solution. Though this is not a tips, but you must read and take some lessons from this post. Read it properly with patience. I got admitted at Dhaka City College to study BBA in the year of 2008. In that time I didn't familiar with the use of internet. But I was very interested about Computer since 2005. I used to discuss computer related issues with my classmates. One of them was Adnan Shameem. He had a nice forum named Amarnotes (Lost due to the error in server). He often told me to visit his site. But I didn't have net connection. And even I didn't have a personal computer! One day I went to a Cybercafe with Adnan. He helped me to open an email account: munnamark@gmail.com. I could never imagine one day this email might be associated with hundreds of online accounts! And at the beginning of the 3rd semester, my course teacher (Ms. Sayeda Ferdous Lusanta), Principles of Marketing, declared that- Everyone must have net connection to complete my assignments. What a declaration! And I got a chance to demand a net connection in the parliament. Within a week, I got a net connection. It was Citycell Zoom. Later I upgraded this to Zoom Ultra. Now this connection should also be upgraded. And no other suitable substitutes are available in my area. After getting the net connection, I was busy to learn necessary online applications. I learned many things about Internet and computer using the net. I discovered many tips and shared these with others. Here I’d like to thank Adnan again. He told me- Open a blog and share these tips. But initially I was not interested. I thought- is it necessary at all? 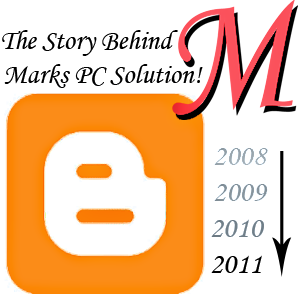 Then after a few days I opened a blog in blogger. I named my site as Marks PC Solution. The URL is- munnamark.blogspot.com. That's the starting. After that I also opened an account in WordPress by the same name- Marks PC Solution and URL is munnamark.wordpress.com. But I didn't continue that site as premium membership is required to edit the template manually. But you can still access my WordPress site. Marks PC Solution was created in 2009. Only 9 posts were written in Bengali. In that time I was not so interested to keep it active. And I didn't even visit this site in the next year I mean in 2010. I almost forget that I've a site on blogger! At the end of 2011, I had an offer. It was a free course on Online Earning. It was a 2-day training conducted by BIDD (Bangladesh Institute of Design & Development). The training venue was also very attractive- Prime Minister’s office of Bangladesh! In my class there were more than 50 students. But it was decided that only one student is allowed to go for the training. When our BBA coordinator declared this in our class I wasn’t there. Because it was off-time and I was busy at our computer lab. I didn't let her understand that I’m surprised. I just answered YEAH. Then she told- Every one of the class is looking for you. Then I showed my exclamation- WHY? She said- a training will be arranged for some students of our college. You should go to the class to know the details. Emrul knows better. Then I left the lab and went to the class. Emrul helped me a lot. He told me that- Only one student of this class is allowed to go for the training. And we think- Only you are the right person. He also took permission from others. He asked- does anyone have an objection? Thanks to almighty Allah! There was no objection. Everyone agreed. I am grateful to my classmates. They left their chance for me. I was selected from Section: D. And it’s my pleasure that Adnan was selected from Section: C. His friend Mahin left the chance for him. Otherwise Adnan might face little competition to be selected. I had no idea about topics will be covered in that training. All I knew about it- It’s an online earning course. Maybe they will train us about how to learn online. Finally, it was a nice morning of winter. I left my home at 6.45 am. And arrived at Vasani Novo Theater at 7.40 am. There were our teachers and other students. Our teacher Md. Shamsul Arefin enlisted my name in the attendance sheet. Almost all students were present by 8.00 am. There were more than 100 persons including teachers and students. We started walking to the PM Office. But I was worried because Adnan wasn't present there! And carrying bags and mobile phones were forbidden for the students. While running by the side of a newly constructed road we noticed a serious motorbike accident! Maybe the biker was taken to the hospital but spot dead. Such a bad scene at the beginning of the day! We reached the PM office gate and waited there for more than 40 minutes. By this time Adnan arrived there! Everyone was waiting to enter the main building. After completing some formalities the officials provided us the visitor cards. Without this card no one is allowed enter the PM office. Topics: Working in oDesk, Microworkers, Microturks, Freelancing, Blogging, SEO, Google AdSense, Opening Accounts in PayPal, Payza (Former Alert pay) etc. After the training of BIDD, I decided to develop my site. I tried to earn money through blogging with the help of Google AdSense. I translated previously published Bengali posts into English. Because AdSense doesn’t support Bengali blogs usually. I also got AdSnese in my site. Several times Google rejected my application. But finally I got it with more than 50,000 page views and 90 posts. Unfortunately my AdSense account was disabled due to invalid clicks by someone. But later I got it again. Everything was fine. But this time Google banned me without proper reason. In fact, Google’s policy is very hard for Bangladeshis. AdSense is too strict for us. I really disappointed when my AdSense account gets disabled. But I never stopped writing. I also submitted my blog to those illegal sites that offer free pageviews. But later I understood those views are machine generated. So I stopped submitting my blog to those sites. These sites are very harmful for your blog. If Google found your site in those illegal sites, you might be banned or ignored in Google Search Result! I also submitted this blog into social sharing sites and online directories. Definitely these are valid ways to increase traffics. And I used to comment and post on popular forums, blogs and other sites. I’ve got lots of visitors from those sites. I not only requested them visit my site, but also told them to share my site on Facebook, Twitter, Google Plus. And with this, giving like, tweet and +1 were mandatory. They were also kidding me and saying- I’m crazy. And really I am! I knew these will never increase my visitors. Because I had only few classmates who are regular with me at chat. They can visit my site only 10 to 20 times a day. Then I decided I will never make them bore. Because this is not effective at all. Who needs my contents will automatically visit my site. I don’t need to tell them. And people are not only busy with blogging like me. They have other works too. Now my policy is just- writing better. In each new post, I try to develop my style. I always try to write good and unique contents. I don’t submit my blog to the sites which offers page views and social sharing. This is really a bad idea. Most importantly these are not original. And I don’t like fake pride. Now I’m quite happy with the performance of Marks PC Solution. More than 7000 pageviews, 4000 unique visitors and 3000 new visitors per day. Marks PC Solution has more than 2,00,000 pageviews in the last 30 days! But this is not enough. I would like to take it to a higher position. Still this site has no page rank. But most of my visitors come from Google! And it has a good position in Google search results. Don’t know why page rank is 0 for Marks PC. In Alexa, the position of Marks PC Solution is excellent. My Alexa traffic rank is less than 1,30,000. Sometimes it goes under 1,00,000. I've already published 415 posts. And this one was post # 249. Generating the post idea is the most difficult task in blogging. Sometimes I search other blogs and forums to get ideas. And sometimes I try to find what creates problem for bloggers and PC users. Then I try to solve those problems in my posts. I also try to collect ideas from my visitors. Sometimes they share their views. But those are not enough to generate ideas. In that time I get disappointed. Because the main feature of a blog is new contents. Still I can say Marks PC Solution is active and unique. At the beginning I had a tendency to copy the posts. But immediately I give up such a bad idea. Because if you wanna be a successful blogger, you've to be creative. But if you copy the posts of others, creativity will die before the birth! So that’s the end of the story of Marks PC Solution. I tried to keep this short but it takes more than 2000 words. Sorry to write such a long post. None of my posts is so long. Thanks for your patience. Last year, on April 29, 2014, I've purchased domain for my site. I've changed the domain from munnamark.blogspot.com to www.markspcsolution.com. After changing the domain, there was a dramatic decline in traffic. At that time I had to bear a huge loss. Now I'm trying to recover it. Still I haven't been able to recover my previous status as it was before changing the domain. Read more . . .
Wow. I am all over this post! Such good memories you have written about. We could talk about almost every paragraph in this post. And it is good to know that I am a part of this website. "Now my policy is just- writing better." - I have told about it a million times. Yes, increasing visitors is important. But people loves unique things, unique posts. Good content always gets rewarded. Even Google spends millions of dollars to invent algorithms that find good content on the internet. Write things that people don't find elsewhere. It is definitely a difficult thing to do in case of computer-related blogs, because there are so many other blogs writing about these same things. But if you think creatively, you can succeed in anything, even in this blog. I always pushed you to write. I have criticized you badly some times, but never wished that you stop writing. I have criticized you to develop yourself. I have wounded you so that you can find passion about this blog yourself... find the rage to succeed. And I will still help you in your path as much I can. I have recently opened a blog about FreePascal Programing. Programing itself is a challenging thing to write about, especially inventing new codes to do many new things with our computers. Moreover, FreePascal is a very unpopular language to write on. But I am enjoying the challenge. Because I love programing. And I believe, every programing language can work its magic. And I will make this language popular, because I believe in it. I strongly encourage you to believe in what you want to achieve too. There will be many hindrances in the way, but if your soul believes in one thing, you should do it. Actually I skipped many things. Maybe there could be more words and memories. But didn't try to make it complex. And you could create a link back to your newly designed site I mean- FreePascal Programming. "And you could create a link back to your newly designed site I mean- FreePascal Programming." I thought that you are not interested in programing. (But one day on your blog I found out a cute little post on HTML basics! That was surprising.) If you are interested, it is LazPlanet.blogspot.com I was so busy on creating posts that I almost had no time to spend on its design. Although I have plans for its branding in future (like omgubuntu.co.uk ). Hey Munna. We should meet sometime. It's been a long time since we met face to face. What do you say? Fully Solution is Motivated more to read about you thanks 4 this story behind the establishment of Marks PC Solution. To be honest, I never expected comments from readers after writing this post. I thought who cares about the history of Marks PC Solution? You're welcome to Marks PC. But if this is a spam, then I will mind for sure! glad i could be of help at some point..
Nice to get a comment from you! Wow, I really loved your story Abdur. I too started blogging at the same time you started. I made around $4000 from one site. But now my Adsense earnings are low with new sites. Also I think the competition for tech blogs is very great. Anyhow, please keep sharing your tips. Let me know how to increase Google Adsense CPC? To increase your earning, Google's Advice is to use all types of ads - Text, Image, Rich Media. Contents should be unique and interesting. Your robot txt should also be proper. BTW, what is your RSS feed link.. ? I mean to Feedburner or any other. I just want to bookmark! You can directly subscribe to my site by submitting your email. Look at the bottom- Follow by Email. You can enter your email and submit it for email delivery. U are realy a genius in the blog sphere. This memories have realy rekindle my interest and ambition to blog more. Thanks bro. Don't know how genius I am. Or am I genius at all? But I try my best to give something to the valued visitors. Hope you will continue staying with Marks PC. Thanks for the comment. Thanks for excellent writing. I salute you. I always honor such kind of people like you who are able to change their fate with their hard work. The present world is for them who can make possible the impossible. I think you've done it. Life is a sum total of moments. The success of life depends much on the proper utilization of the moments. I can easily identify the exceptional people. I don't do mistake to discover you. Because, I came across the way that you had crossed. My life is also full of mystery. In a particular site, my life's history is a little bit similar to you. However, it is not the time to say my life story. I merely appreciate you. I honor you for your works and positive mentality. I've read every line; every word of your post. It may be an example for the thousands of unemployed youths of Bangladesh. You have proved that everything is possible.Your helping mentality is also worthy of praise and impress me very much. I pray to God for your long live and better success. You will go a long way I believe. Thank you very much. Hey, don't praise too much! I'e just managed AdSense only. Still I need to go a long way! I'm jealous of you ! By the way, what do you do? Do you have any blog? Dear Friend your is so Good ,I like Him Very Much .I see 360 Adds ,Button on your site .pls tell me how increase Clicking from visitors,i have 7000 pages views in a day,But my Earning is Very low may 4$ in a day.please tell me As Soon As Possible.i am waiting your Urgent Response .My Blog is Amjadfreesoft.blogspot.com.